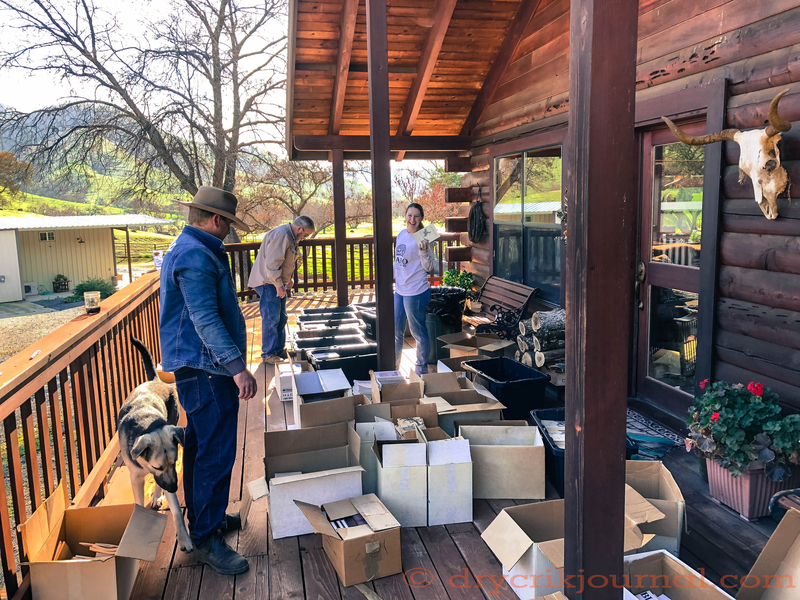 Between rains when we couldn’t go anywhere on the ranch, we began extricating boxes of books from the house that have been published by Dry Crik Press since 1989, including every issue of Dry Crik Review. Boxes were stashed throughout the house, office and attic that we sorted into plastic containers, now half-a-pallet in the shop—the first time that Dry Crik’s offerings have been in one spot. Certainly not a job I relished, Robbin decided to replace the carpet in the living and dining rooms while Bob and I are in Elko. Once we started clearing the floor space, we found box after box of books that had to be dealt with. All of the Dry Crik Review issues, and Dry Crik Press publications prior to 2008, were printed in Craig Lindeman’s garage in Visalia. Craig collected leftover paper from the other print shops, and sympathetic to the cause, didn’t charge much for his work. The books and memories were overwhelming.